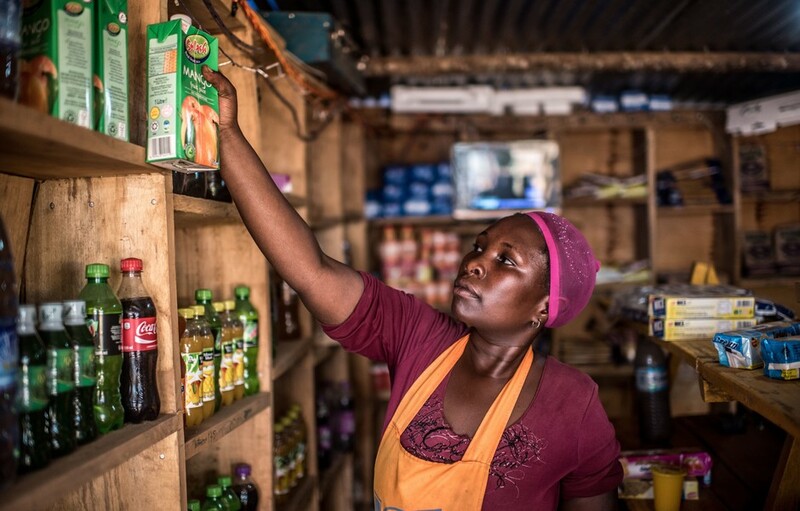 A woman removes a product from a shelf in her shop at a gold mining site in central Uganda. Remarkable progress in access to finance has been made in recent years. The World Bank’s Global Findex data indicates that the number of financially excluded people dropped from 2.5 billion to 2 billion globally in only three years (from 2011 to 2014). Mobile banking and other financial sector innovations are credited for the accelerated pace of inclusion. Nowhere is this more evident than in sub-Saharan Africa, a region that has pioneered the use of mobile banking. Today, 12% of adults on the continent use mobile money, compared to just 2% worldwide. This has been instrumental in reaching people without access to traditional banking services, particularly women. Access to financial products and services can be a key enabler of women’s economic empowerment, but it is unlikely to transform women’s lives and livelihoods on its own. Little is known about how financial sector innovations can have this transformative effect. To fill this knowledge gap, IDRC funded research to explore evidence of impact in the field of financial inclusion and to identify areas for future support. The study Beyond access: Exploring gender-transformative approaches to financial inclusion found that women continue to face many constraints that originate in the household, rather than in the financial sector. For instance, even though some women may have access to financing, domestic inequalities in financial decision-making may prevent them from converting that access into business growth or enhanced productivity. In the labour market, the entrepreneurial ecosystem affects women and men differently. Although both face constraints, female entrepreneurs experience many more due to regulatory frameworks. These frameworks include policies, laws, bank regulations, and socio-cultural norms that dictate the roles women and men can assume, and the resources or assets they can own in markets and financial institutions. A prime example is the inequality in land-ownership regulations that can limit women’s options to present collateral needed for credit. The study’s authors — Saskia Vossenberg, Anne Rappoldt, and Jesse d’Anjou, affiliated with the KIT Royal Tropical Institute in Amsterdam — explore approaches to financial inclusion that would challenge gender inequalities, gender power relations, and regulatory frameworks that impede women’s economic empowerment. This approach is based on a deliberate analysis of how gender inequalities influence women and men’s choices, opportunities, and livelihoods. formal and informal rules and practices (such as regulatory systems and social norms). “Simply said, gender-transformative financial inclusion is about making financial systems ‘women-able’ rather than making women ‘bankable’,” the study’s authors write. The dimensions of change are interconnected and can help pinpoint where transformation is needed to advance gender equality. Multidisciplinary research processes involving a variety of actors are crucial to put this transformative approach to financial inclusion into practice. Current and previous efforts to foster financial inclusion have adopted gender-sensitive designs. While these efforts can make valuable contributions to individual women, they are not transformative because they do not challenge the underlying barriers that hold up women’s economic constraints. Gender-sensitive strategies in microfinance, for example, may help to expand women’s agency by increasing their choice of occupations and how they manage risk. These changes might increase economic self-reliance, but alone they cannot address the social barriers and regulatory frameworks that sometimes prevent women from engaging in paid labour altogether. Other examples of gender-sensitive interventions include digital financing and financial literacy programs for women, support for women’s collective action groups, and programs to engage men in discussing gender roles. Although these approaches to financial inclusion are useful in improving confidence and enhancing agency, they are not as effective as multidimensional approaches targeting both the supply and demand side of financial services. To identify which method and approaches will reap the most gender-transformative effects, new empirical research is needed. “We need to ask what women entrepreneurs want from money and how they want to use it in order to understand what financial delivery mechanisms are needed,” the study states. Several research questions emerged from this study at a June 2017 consultation in Nairobi, jointly hosted by IDRC and the MasterCard Labs for Financial Inclusion, based in Kenya. Which interventions and approaches to financial inclusion can be combined, and in what way, to most positively affect women’s livelihoods? How should programs effectively combine financial and non-financial services by enlisting a cross-section of stakeholders? How do changes in the types of financial services offered build more agency for women in the household, improve negotiation dynamics with financial institutions, and mitigate regulatory constraints? Given the complexity of social and economic dimensions of women’s financial inclusion, research in this field requires an interdisciplinary approach that combines qualitative and quantitative research methods, the report concludes. Filling gaps in the research can lead to a more holistic understanding of which strategies, products, and service delivery features, and in what combination, will deliver transformative outcomes and institutional change. Both evidence and practice urge a move away from financial inclusion measures targeting issues of access to financial products and services, and a need to understand under what conditions financial inclusion is most likely to influence structural change. Read the policy brief Beyond Access: Shaping a gender-transformative approach to financial inclusion.